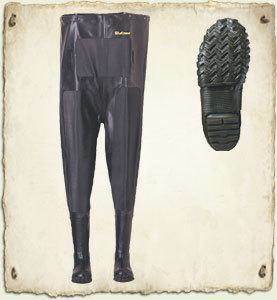 -100% waterproof, ozone-resistant, heavy-duty natural handcrafted rubber. Trac-Lite outsole for all-terrain traction. Insulated foam-rubber bottom with 8mm wool felt midsole for warmth. Removable EVA insole for comfort and cushioning. Cotton/canvas lining with reinforced knee and belly patch. Steel shank for arch support.